The report shows that government policies and sanctions appear to be forcing councils to release Green Belt land for development. Drawing on local evidence provided by CPRE branches in Bedfordshire, Berkshire, Buckinghamshire, Essex, Hertfordshire, Kent, London and Surrey, the report demonstrates that the London Green Belt is likely to be under greater threat than ever. There are now plans for 203 sites within the London Green Belt including proposals for 123,528 homes. Within the 42 local planning authorities that were surveyed covering nearly 84% of all London Green Belt land, the majority of the proposed homes (94%) are on sites allocated by councils in their Local Plan documents. The London Green Belt is also under pressure from infrastructure such as schools and roads. The report finds that there is national pressure being applied to Local Planning Authorities to deliver inflated housing targets. These targets are being inflated by unrealistic economic growth forecasts, forcing councils to give up Green Belt land. The government’s planning framework states that only ‘exceptional’ circumstances should allow building on Green Belt land. However, unclear national planning guidance and confusing government messages are causing councils to believe that in order to gain national approval of their Local Plans, they must meet higher targets. This is causing them to look at Green Belt land to meet housing growth figures. 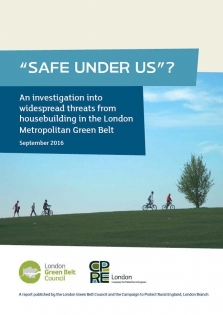 Richard Knox-Johnston, Chair of the London Green Belt Council said: “Promises were made in the Conservative general election manifesto that the Green Belt would be “Safe under us”. However, councils are telling their residents that there is no alternative but to build in the Green Belt. Our evidence shows that in spite of the government’s promise, councils are responding to a series of national messages and policies which forces them to release Green Belt land to receive financial incentives and avoid sanctions.